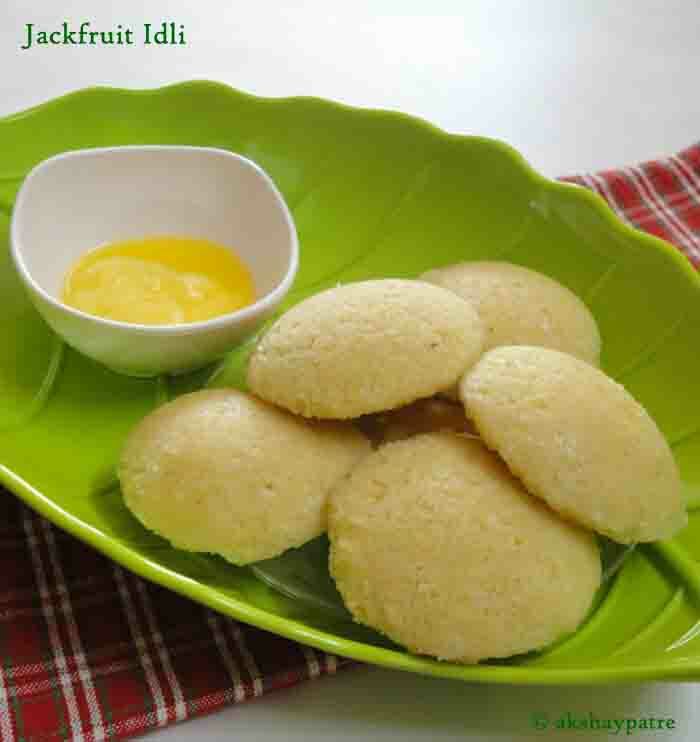 Jackfruit idli recipe - Today I present a very delectable jackfruit idli recipe prepared with rice, fresh coconut, jaggery and jackfruits. This idli is usually served for breakfast. 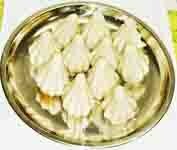 It releases the fragrance of jackfruit. Panasa idli or halasina hannina idli is a traditional coastal Karnataka cuisine prepared in every homes with their own versions. Jackfruit is one of my favorite fruits and I am a great fan of it. 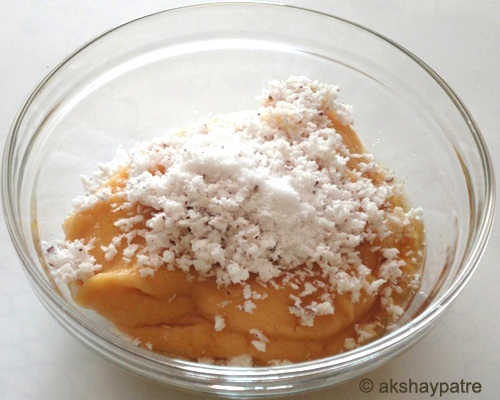 It is a flavorful fruit and the idli gets an inviting flavor from it. What makes it different from other idlis is its flavor and sweet taste. I brought the whole jackfruit from the market. It is a seasonal fruit and available only for few months. At this time I bring jackfruit and we eat it in its natural form as much as possible. I use the remaining pods to make idli and kheer. Cutting and removing the jackfruit pods is a tedious sticky job. But in the end when you separate the luscious pods it is worth the effort. I separate the seeds and store the pods in the refrigerator and use them as and when required. 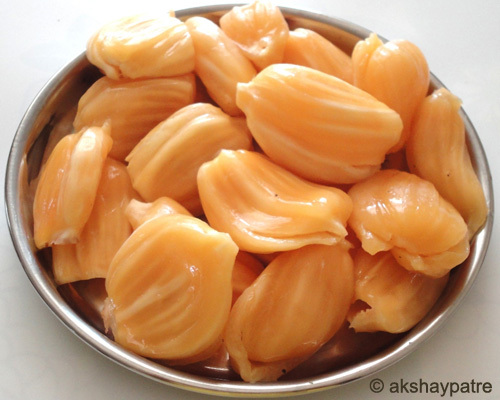 Jackfruit seeds can also be used in making curry, usal, etc. When you put the jackfruit pods in the refrigerator for two or three days they become more tastier than the fresh pods. Back to the jackfruit idli. I have used freshly ground rice rava in this dish. But you can also use idli rava as it is very convenient. 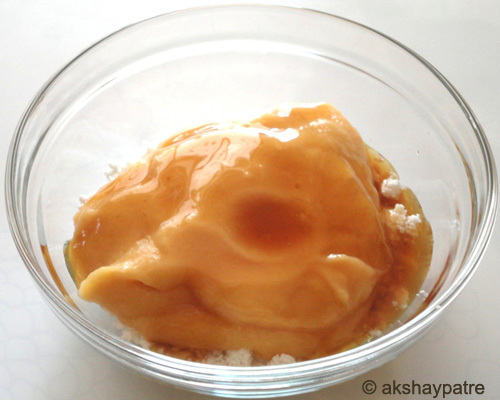 The idli is lightly sweetened by adding liquid jaggery and tastes best when served with ghee. The jackfruit idlis were simply divine. Cut the jackfruit with a sharp knife and separate the pods. 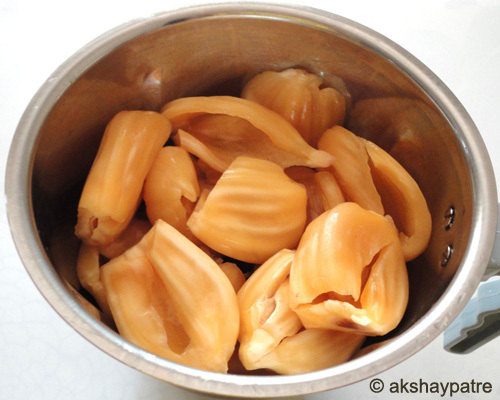 Remove the seeds of jackfruit pods. Rinse the raw rice and soak with sufficient water for 3 hours and set aside. Drain the rice and put it in the same mixer jar and grind to make a coarse paste without adding any water. The paste should be like thick rava. Transfer the rice rava to a large bowl. 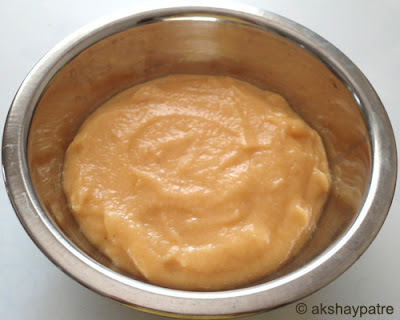 Transfer the puree to a bowl and set aside. Add the jackfruit puree to the above prepared rice rava. Add the liquid jaggery or grated jaggery to it. Add the grated fresh coconut and salt. 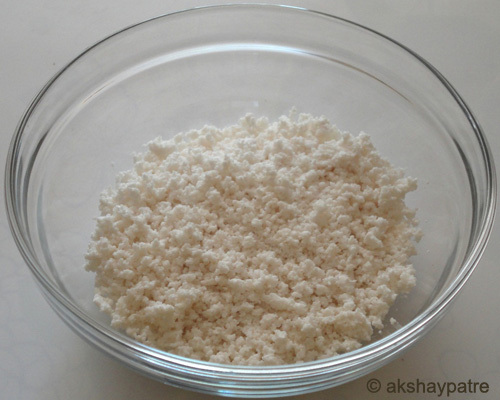 Mix well with cut and fold method to make a thick idli batter. 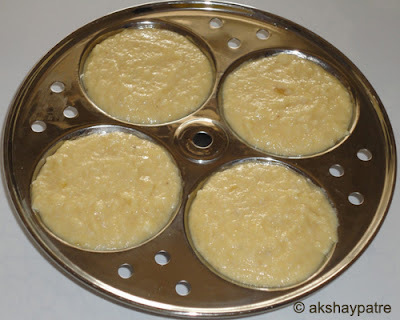 Grease the idli plate and pour the above prepared batter in the idli mould. Cook it in a idli cooker on high flame for 20 minutes and then on low flame for 5 minutes. Switch of the flame. After 5 minutes remove the idli plate and keep it aside for 5 minutes. Take a blunt knife or spoon and remove the idlis. Serve the jackfruit idli hot with ghee. While grinding the rice and jack fruit do not add water to it. The paste may turn watery and idli will be sticky. 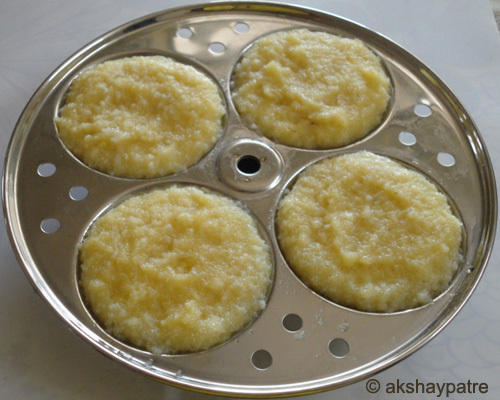 You can also make this idli by using rava or semolina instead of rice. But the idli made with semolina turns sticky and I don't like that texture. The batter doesn't need any fermentation, so that you can prepare the batter whenever you feel like to make idlis. 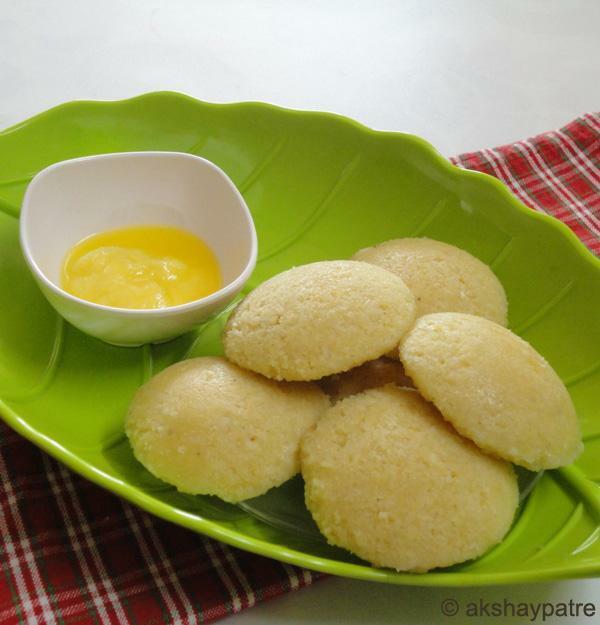 Instead of soaked rice rava you can also use instant idli rava to make this idli. If you don't have liquid jaggery, use grated jaggery. I make liquid jaggery at home by boiling the grated jaggery in some water and then simmering till it attains a consistency of honey. make pouring consistency liquid jaggery. 1. Cut the jack fruit with a sharp knife and separate the pods. Remove the seeds of jackfruit pods. 2. Rinse the raw rice and soak with sufficient water for 3 hours and set aside. 3. Drain the rice and put it in the same mixer jar and grind to make a coarse paste without adding any water. The paste should be like thick rava. 4. Transfer the rice rava to a large bowl. 5. Put the jackfruit pods in a mixer jar and blend it to a smooth puree without adding any water. 6. 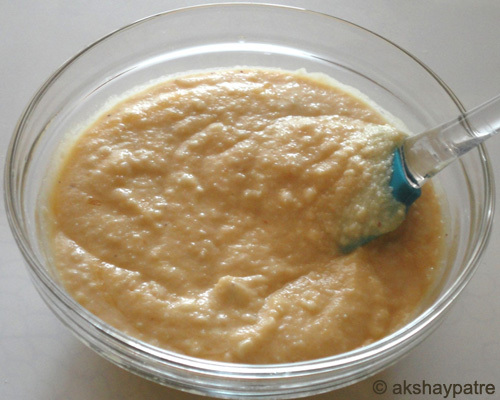 Transfer the puree to a bowl and set aside. 7. 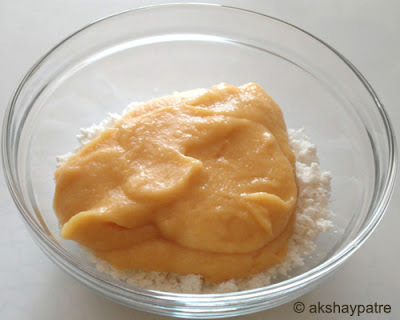 Add the jackfruit puree to the above prepared rice rava. 8. Add the liquid jaggery or grated jaggery to it. 9. Add the grated fresh coconut and salt. 10. Mix well with cut and fold method to make a thick idli batter. 11. Grease the idli plate and pour the above prepared batter in the idli mould. 12. Cook it in a idli cooker on high flame for 20 minutes and then on low flame for 5 minutes. 13. Switch of the flame. Remove the idli plate and keep it aside for 5 minutes. 14. Take a blunt knife or spoon and remove the idlis. Serve the jackfruit idli hot with ghee. jack fruit is my favorite..hearing this recipe for the first time..tempting!! wow..this is interesting,never had or heard before..will try !! This is an interesting idli recipe, looks yummy..